Frankie Valli. Johnny Maestro. The Righteous Brothers are a testimonial to the evolution and magic of American Popular Music. One of the most outstandingly successful groups in pop history, Frankie Valli and the Four Seasons were filmed in Atlantic City during their 1992 US tour, performing many of their most popular and widely acclaimed hits. 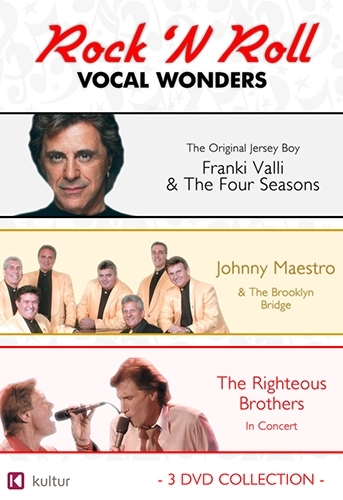 Inducted into both the Rock 'n Roll Hall of Fame and the Vocal Group Hall of Fame, Frankie Valli has scored 39 Top 40 hits in the course of his illustrious career. In 1969, with Johnny Maestro as their lead singer, The Brooklyn Bridge released its debut album , scoring a top five hit and a gold record with the Jimmy Webb composition The Worst that Could Happen. By 1972, the Brooklyn Bridge had sold over 10 million records and established Johnny Maestro as one of the premier vocal talents of the era. As part of the Pop Legends Live concert series, Johnny Maestro and the Brooklyn Bridge take to the stage to perform all of their greatest hits and many other classics. As an added feature, the Pop Legends Live series also takes you backstage for rare behind-the-scenes interviews with Johnny and the group. Includes live interviews. In a 1983 concert, Bill Medley and Bobby Hatfield - those seminal rock 'n' rollers known to the world as The Righteous Brothers - reunited to bring back "blue-eyed soul" music. Filmed live at the Roxy Theatre in Los Angeles, this show includes all of their greatest hits including stunning versions of You've Lost That Loving Feeling , Unchained Melody, Ebb Tide, (You're My) Soul And Inspiration and many more!